Polish top model Anja Rubik displays the magnificent form and prodigious modelling talent that has kept her in the industry spotlight for close to a decade, in an editorial lensed by Mario Sorrenti. 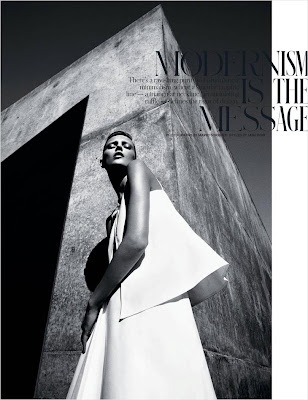 Sorrenti makes the most of the multi-talented model's dynamic lines in the New York Times T Magazine editorial entitled "Modernism is the New Message." Twenty-nine year old Rubik echoes the editorial's strong focus on fashion's new minimalism and graphic shapes, with a stunning display of body contortions and simmering sensuality. In between plum modelling assignments, Rubik has her hands kept full as Editor-in-chief and Creative director for 25 Magazine, and as a designer of a newly launched capsule collection for shoe designer Guiseppe Zanotti. Leading roles aside, Rubik remains at the top of her modelling game in this erotically charged editorial set amidst a stark desert landscape with concrete walls and shadows as her solitary props.